Activists gather at the Israeli consulate to affirm their solidarity with the Palestinian people, and to protest Israel's brutal occupation. Los Angeles: Activists from several peace and justice groups gathered infront of the Israeli consulate yesterday to protest against the Israeli occupation of Palestine. The protests were prompted by the four-week siege and attacks on the town of Nablus. 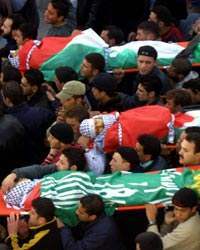 During this time, at least 18 Palestinians had been killed and over 250 injured. The town had been under 24-hour curfew much of the time, and homes have been demolished in the Balata refugee camp, Beit Foreek, and the historic center of the city. Aqueducts and tunnels dating back to Roman times have been damaged, and other sites destroyed, resulting in condemnation from the World Archaelogical Congress. In a press conference last week, the governor of Nablus summed up that the people of Nablus are asking for an end to the occupation so that they could live in freedom and in peace. At the same conference, Dr. Mustafa Barghouthi said that the Israeli Occupation Forces rampaged through the city like death squads. Dr. Barghouthi mentioned executions that had taken place the day before, including the case of Rbed Al Khassas, who was used as a human shield and then executed. 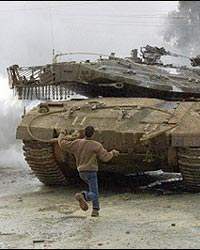 He also recounted the story of 17 year-old Mohammed Al-Masri, who was shot in the head by an Israeli sniper, while he was carrying the coffin of his 15 year-old cousin, who had also been shot by an Israeli sniper. Dr. Barghouthi stressed that journalists needed to disseminate the truth instead of presenting Israel's version of the narrative. The rally in Los Angeles was a signal of solidarity with the people of Nablus and other areas that are continuously under attack, such as Rafah. More than 50 activists stood on the street corners during rush hour, carrying signs, banners, and flags, and chanting slogans. They held signs denouncing the Israeli occupation and the Apartheid Wall, and supporting Palestinian human rights. Many of the passing cars honked in support. On the other side of the intersection was a smaller counter-demonstration, with about 12 members. They carried Israeli and American flags, as well as signs about suicide bombings and the Apartheid Wall, and passed out flyers. In a scuffle with one of the pro-Palestinian demonstrators, they said "Palestinians have a home - its called Jordan," indicating support for further ethnic cleansing. The solidarity rally was organized by Women In Black - Los Angeles, and sponsored by the International Solidarity Movement - Los Angeles, National Lawyers Guild - Los Angeles, the Coalition for World Peace, CodePink, Freedom Socialist Party, Radical Women, the Middle East Fellowship of Southern California, the Council on American-Islamic Relations, Palestinian Aid Society, Palestinian American Congress, Palestinian American Womens Association, the Palestine Labor Support Committee, and Cafe Intifada. The next major event is the anti-war protest and march on March 20th, and the A.N.S.W.E.R. Coalition of Los Angeles, issued and handed out leaflets for this at yesterday's event. Among the sub-headings was "End the Colonial Occupation from Iraq to Palestine & everywhere." The points on the flyer included "We will demonstrate on March 20th in solidarity with the Palestinian people and their right to self-determination, including the right to return."